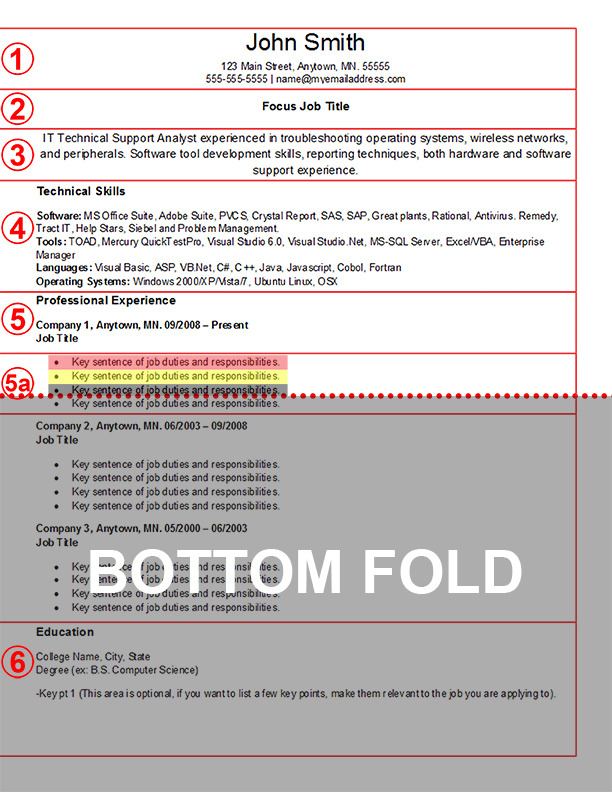 I created the IT Resume Template as a guideline for IT Candidates to use in any career phase. My IT Resume Template was drafted with the help of numerous HR people, Hiring Managers, IT Recruiters and my own personal experience as an IT Recruiter. We created a set of guidelines based on what makes great candidates stand out from the crowd. It takes work to create a powerful resume. By starting off with a strong set of guidelines, you will be well on your way to landing your dream opportunity. It is important to include your most relevant contact information on your resume. If you list an e-mail account, make sure it is an e-mail account that you check. Avoid listing a fax number as it looks “old school” and not relevant. When listing phone numbers, only list your best one. If your cell phone is the best place to reach you, you should only list your cell phone. In regards to e-mail addresses, make sure you are using a professional e-mail address from a modern e-mail provider. Make sure your e-mail handle conveys a professional image. Gmail is always an excellent example of a modern e-mail provider. Your address is optional. I would recommend listing your address as it will open you up to more location based searches from potential employers. Be sure you match, if not copy the job title on your resume to the opportunity you are applying for. This may not seem very important, but by matching your job title, you start the psychology that you are a fit for the role. Only match the title if it is true that you are a match for the position you are applying for of course. Make sure that any relevant certifications are listed in your job title, especially if they are requested in the description of the opportunity you are applying for. For instance, if you are applying for a project manager position and you have a PMP certification, it is acceptable to title yourself as a PMP Certified Project Manager. Following your Focused Job Title, make sure to draft a summary of one to three sentences that is a close fit to a summary of the job you are applying for. By writing a focused summary, you prove your job title. If you hold certifications that are relevant to the job you are applying for, you may in addition to your job title, mention your certifications in your summary. Generally when applying to a job online, a resume is sent through an applicant tracking system where a company tracks the progress of how close a job is to getting filled. There are two ways of getting noticed. One: the person sourcing for a particular job collects resumes from applicants who applied to an individual job. Two: someone conducts a boolean search on the resume database built from previous applicants – this is where listing technical skills comes in. Technical skills are generally used as part of boolean search strings as they are easy keywords used in a search for qualified applicants. When listing certifications that have low relevance to the job you are applying for, you can create a technical skills category for “Certifications:”. Only list professional experience for the last ten years. In the above illustration, you will see the first three experience bullet points colored in red, yellow and grey. Use the red and yellow bullet points to talk about major accomplishments in each position. Accomplishments are used to quantify experience. Anyone can have 20 years of experience, but what they did in the last 20 years speaks more than their actual length of experience. After highlighting accomplishments, list up to 6 more bullet points about your previous job function. Most professional IT positions require a degree of some kind. I recommend listing education on the bottom of a resume. A degree is great to have as most professional IT roles require higher education. However, the most relevant information should always be displayed on top of the resume. The goal with your resume is to land an interview and by listing your most relevant content first, your resume will scream that you are a fit. How do I Get a Second Job Interview?